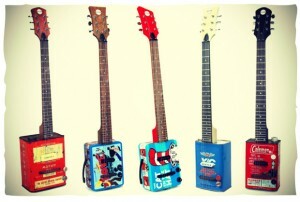 Recycled oil can guitars from Bohemian Guitars. There are occasions in life when you come across a concept or idea and think nah that just won’t work. That was my first thought when I heard about Bohemian Guitars a new US based guitar company. The reason I thought it sounded a little bit wrong was that they build guitars from recycled oil cans. To me the whole concept just sounded all wrong. However, I have to say that looking at what they have lovingly hand crafted I am glad to say that my initial thoughts were all wrong. Bohemian Guitars have created a great looking and sounding guitar from what others would class as unwanted rubbish. What’s more they have managed to make the humble oil can in to something totally cool. The concept of recycled oil can guitars was created by Atlanta based entrepreneurs and brothers Adam and Shaun Lee. The inspiration for Bohemian guitars came from the streets of South Africa. Growing up in Johannesburg the Lee brothers were exposed to street musicians who literally created their instruments from any old rubbish that they could lay their hands on. Taking this on a step the Lee brothers decided to create and build cool looking guitars from recycled oil cans. To bring this dream to life Bohemian Guitars was launched in 2012 and they have big plans to build the company so that it becomes the lifestyle brand of the musical instrument space. 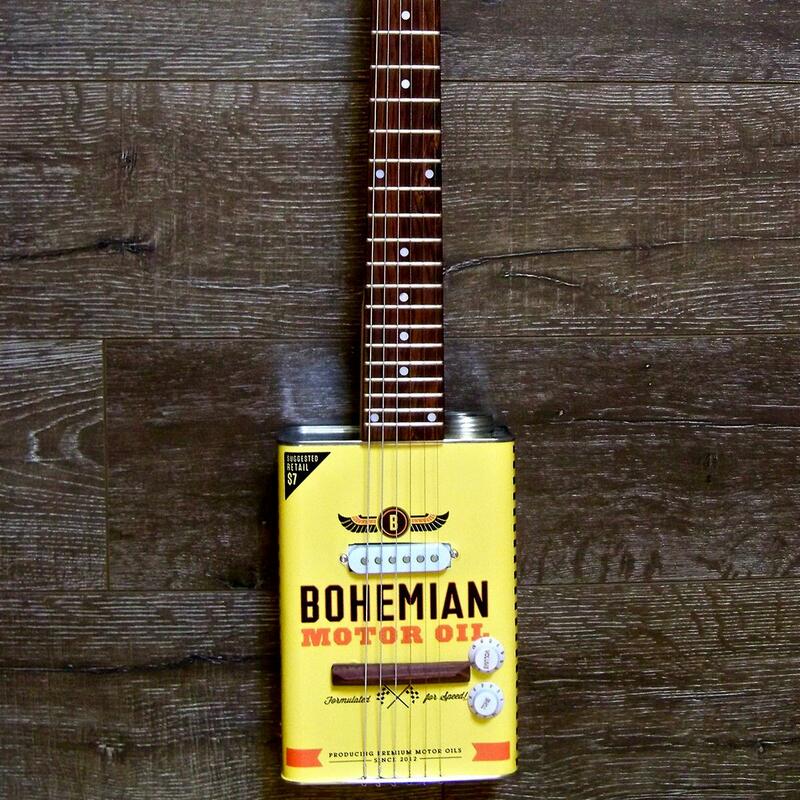 The Boho Series is the branded entry level range of oil can guitars. Since 2012 Bohemian Guitars has successfully raised $126,000 through crowd funding platforms and with this capital injection increased the range of guitars that they produce. Keen to continue the development of Bohemian Guitars the brothers are currently looking for further investment on the crowd funding platform Fundable and you can check out their pitch by clicking on the link. The video below gives you a feel for what Bohemian Guitars is all about as well as the sound and look of the guitars. The Lee brothers claim that the interaction of the magnet in the pickup with the semi hollow metal body gives rise to a deep and harmonically rich tone. This gives the Bohemian Guitars a unique sound and feel which cannot be replicated in any other way. They certainly look unique and have found great appeal amongst guitarists looking for something different. The Bohemian Vintage Series offers you the chance of owning a totally unique guitar made from recycled materials. Currently they have two series of oil can guitars the Boho and Vintage. The Boho guitar features the oil can body with a maple neck and a 24 fret rosewood fingerboard. The guitar is armed with a noise reducing single coil pickup and there are volume and tone controls. 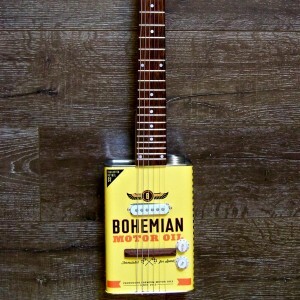 The Vintage range gives you the chance to own a totally unique oil can guitar. 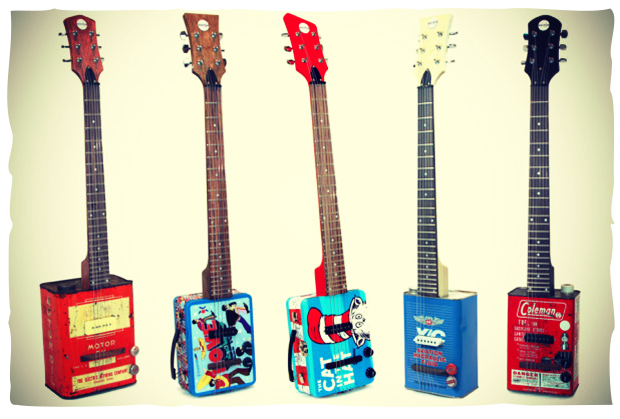 Built from antique recycled oil cans or tin lunchboxes the guitars feature parts recycled from old used guitars. With the Vintage series you are guaranteed that no two guitars will be the same so you are assured of getting something pretty unique. To find out more about Bohemian Guitars visit their website by following the link below. Which was the best decade for Guitars?